This add-on is compatible with Concrete 5.5 & 5.6. Advanced Survey is jam-packed full of rich features and a plethora of options to satisfy even the most demanding control freak. It enables you to collect valuable information from your prospects, clients, members or even staff, and optionally provide an automatic personalised report based on their answers. 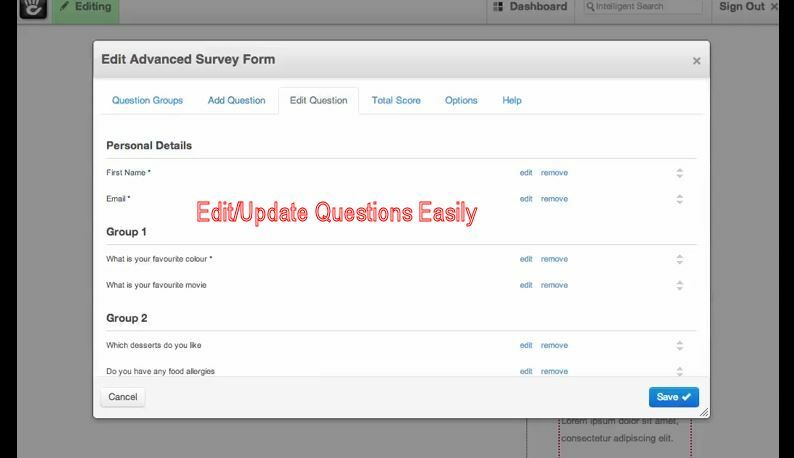 Questions can be grouped together, with "conditional scores" giving you control to limit progress through the survey if a user doesn't complete a high enough score on a question group. 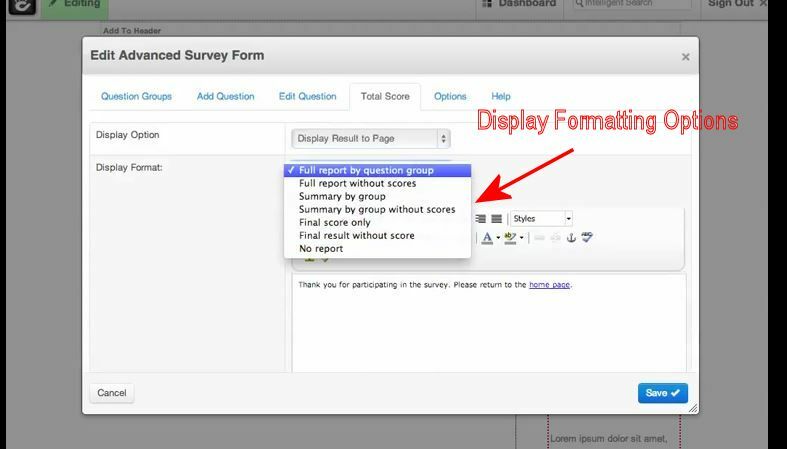 There are 7 different options for displaying the report at the completion of the survey, with the results being shown on the page or delivered to the user via email. 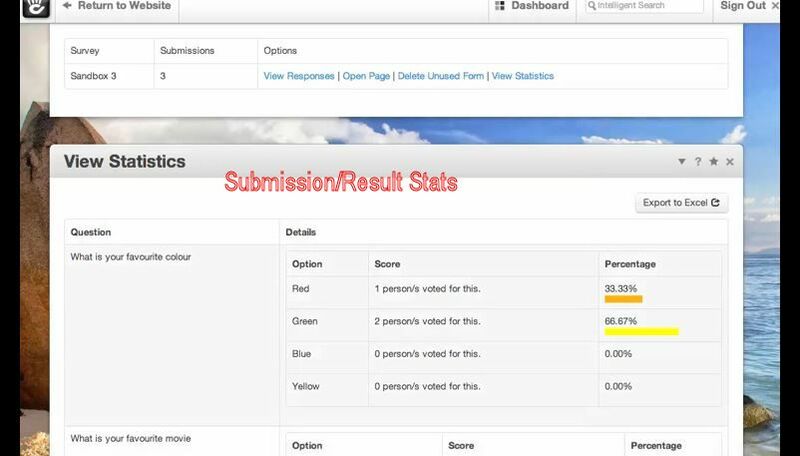 The content of the report is built from a combination of standard results as well as weighted results focused around tiered scores for each question, question group, and the overall survey. For 'red' - Red is a warm colour that means you enjoy hanging around people. For 'blue' - You are cool, calm and collected. For 'yellow' - You may be afraid of life or challenges you are facing. - Evaluate if a potential client meets your requirements and giving them instructions on how to improve their eligibility if they fall short. - Collect new sports club members details and automatically calculate which group they should belong to. For example, if they are only available on Thursday nights, the "C" team practices on that night and would be a perfect match. - Generating leads for any kind of service-based business and assigning those leads to specific in-house sales representatives. - Generating leads and farming them out (or selling them) to associated businesses (and keeping track of the status of each lead). 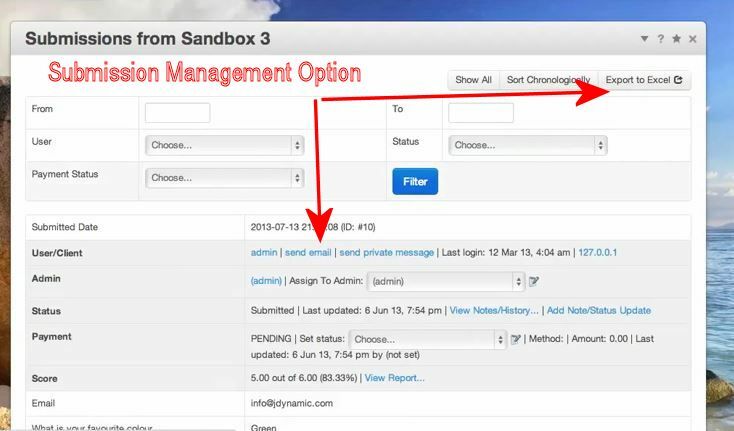 - A project management tool to collect all the required information from a client, then keep track of the progress in the form of notes and images as well an overall status field. - The uses are limitless! 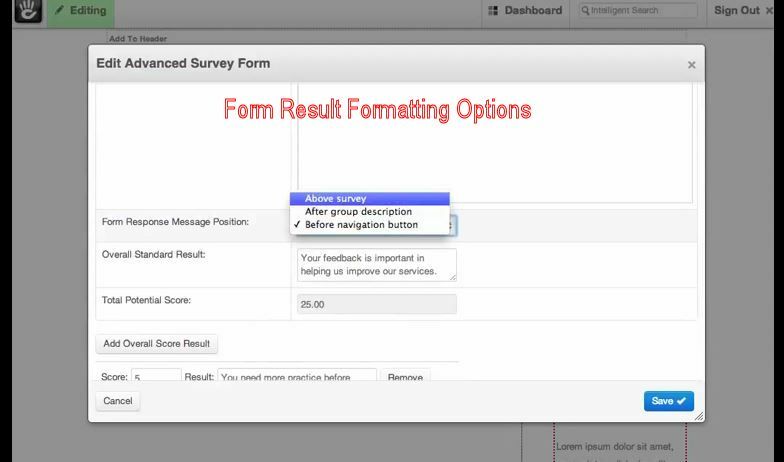 Survey results can be viewed securely in the Dashboard with a comprehensive filtering tool as well as be exported to Excel. 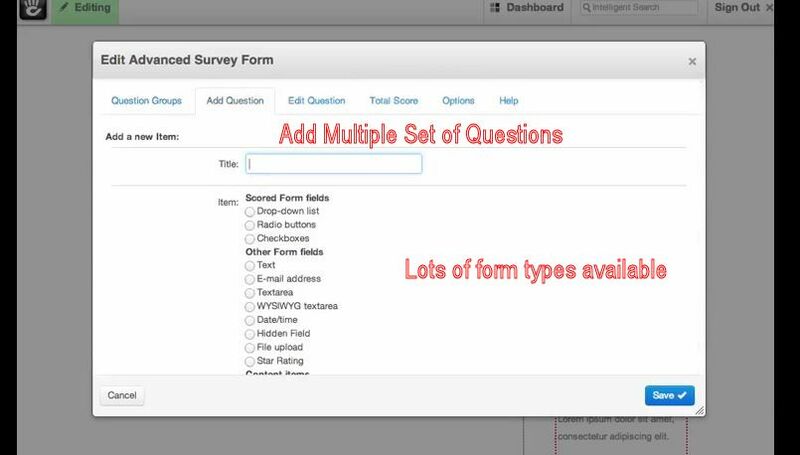 Even statistics on each survey and question can be viewed. For example, find out what percentage of users selected 'red' as their favourite colour. 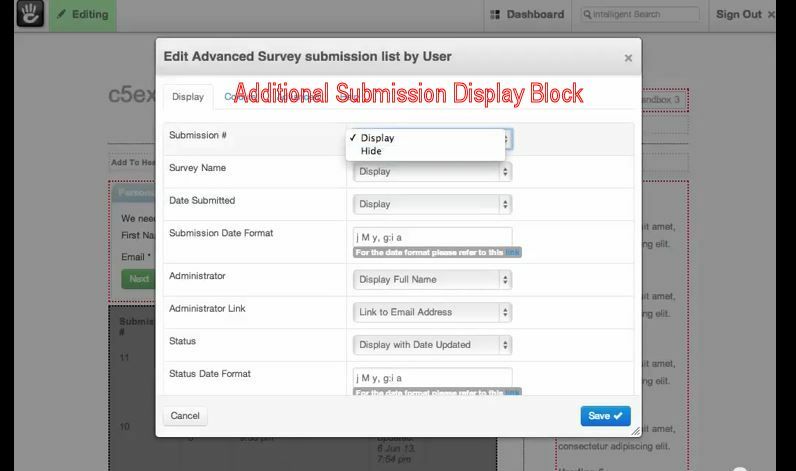 In addition, an extra block is included which allows you to display a user's own survey submissions from a secured portion of your website. 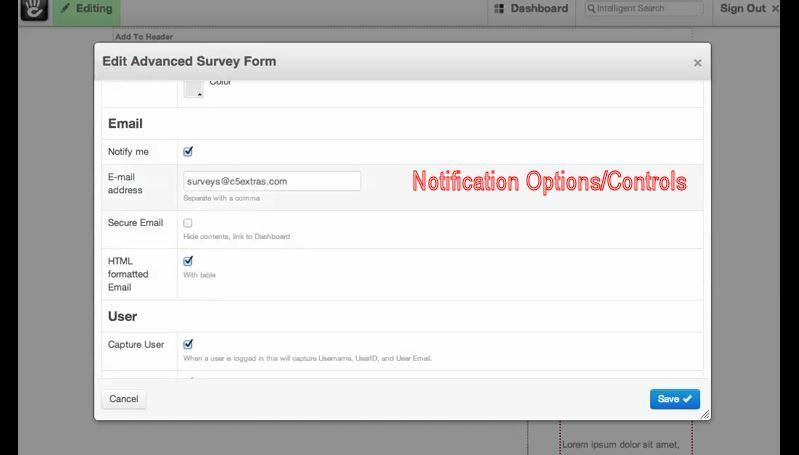 This is ideal for allowing a user to track their survey history and status. 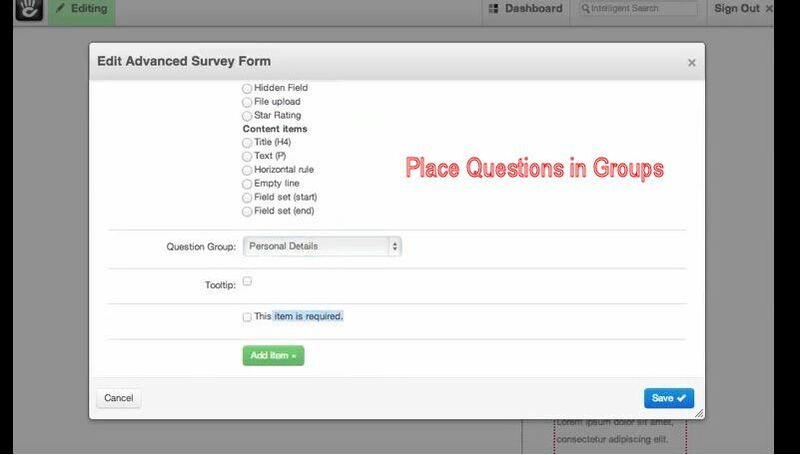 Everything is adjustable, from the button labels to the button colours (7 colour schemes to choose from), to the tabbed question group interface, to the border around the survey. 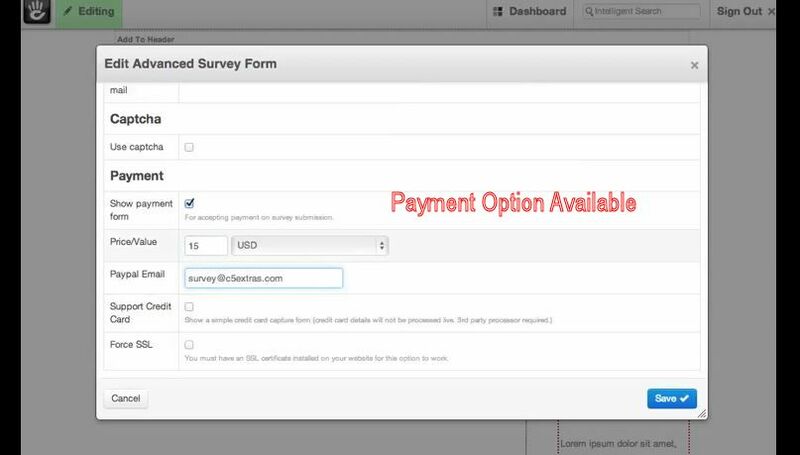 A basic payment form can optionally be displayed at the end of the survey. 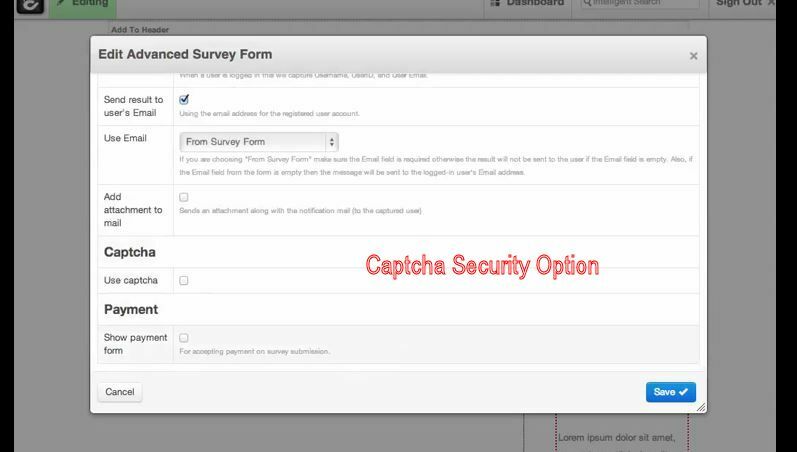 A feature you could use for clients to pay for a personalised survey analysis or additional related services. 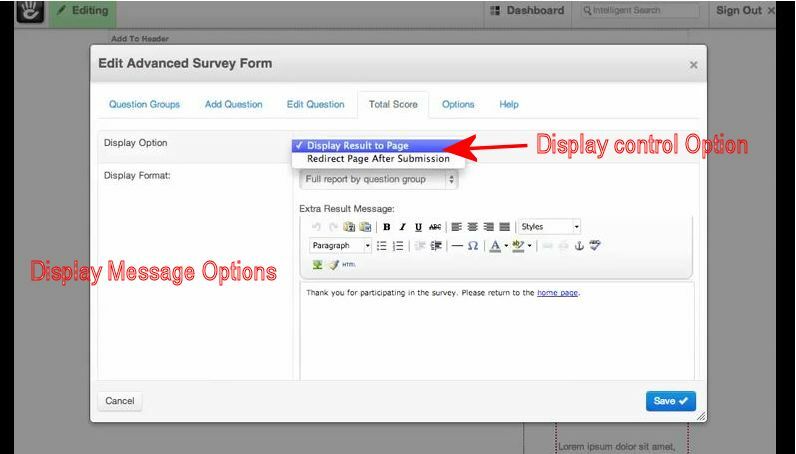 You may have never considered integrating a survey into your website. 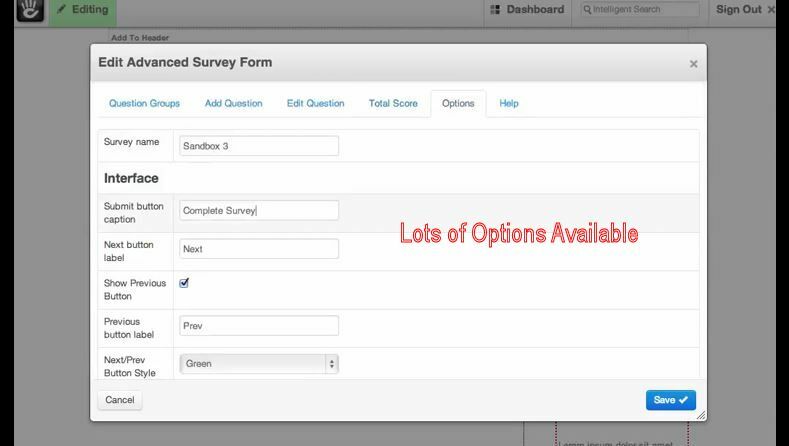 And now, with Advanced Survey, you can do so much more than you ever thought possible with a Concrete5 website. The sky is the limit! 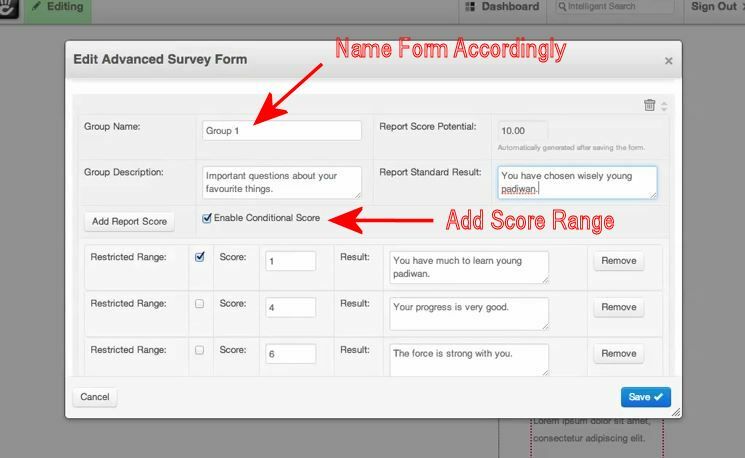 7 different output options for the survey results, from "full report by question group" through to "final score only" (and even no output). 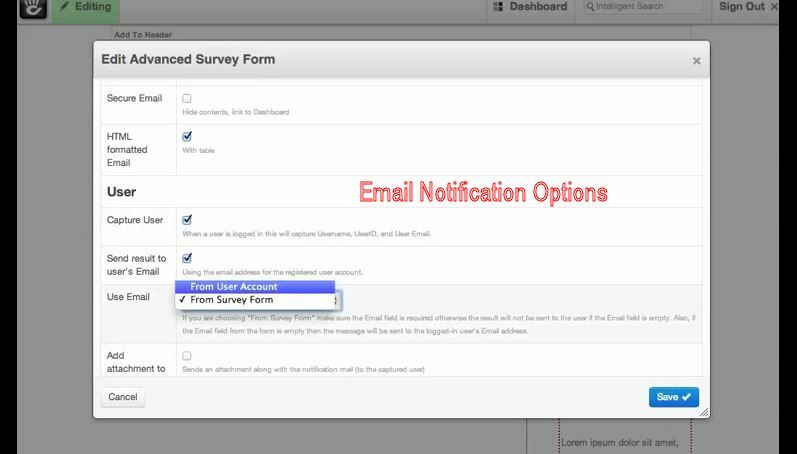 Optional Paypal integration for submitting payment with each survey submission. 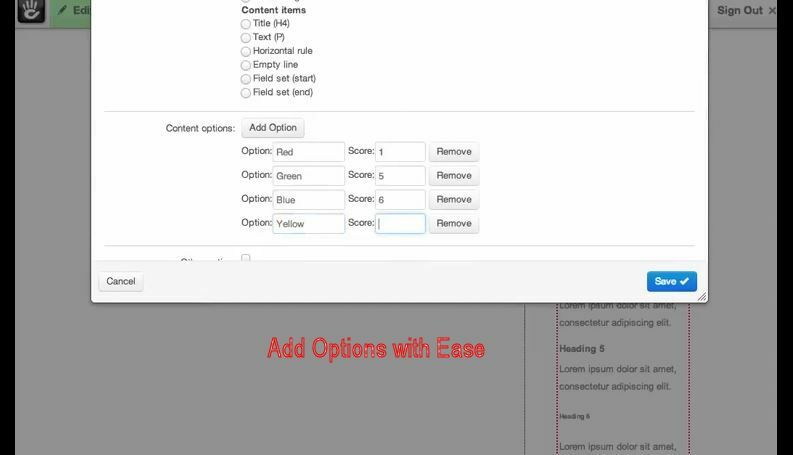 See the demonstration video and separate video for advanced features.